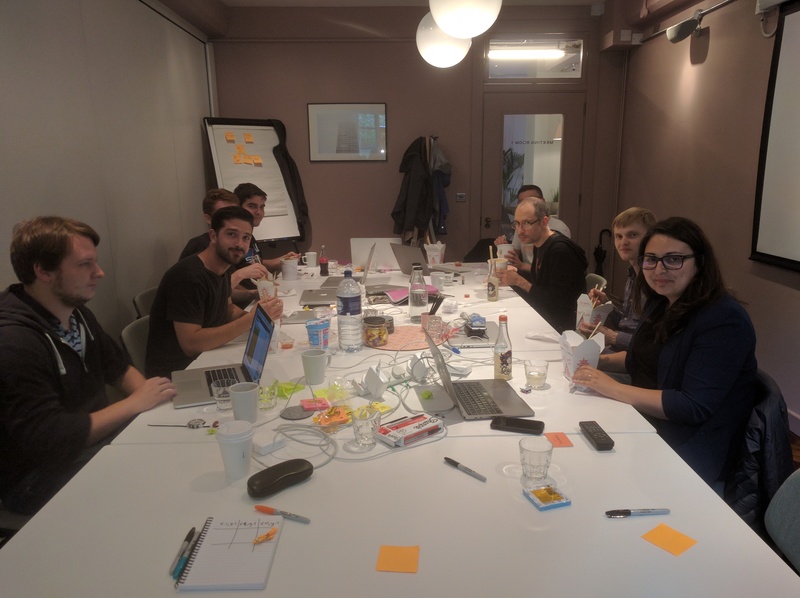 A code retreat is an intensive, one day practice event whereby developers try different approaches to implementing a task following a specific set of guidelines. 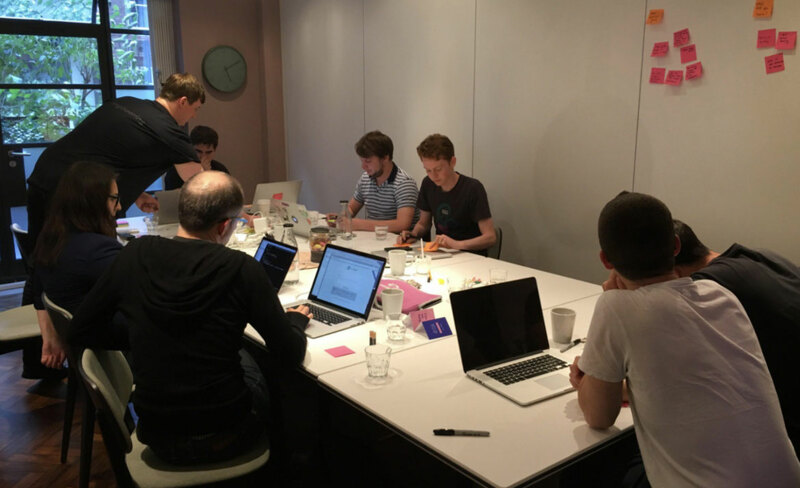 In our case, our code retreat consisted of 5 of one-hour sessions. In each session we would complete our solution, after which we would discard it (yes, really) and start again with different constraints. The point of a code retreat is to get a chance to practice programming concepts while being away from the pressures of deadlines and business requirements. 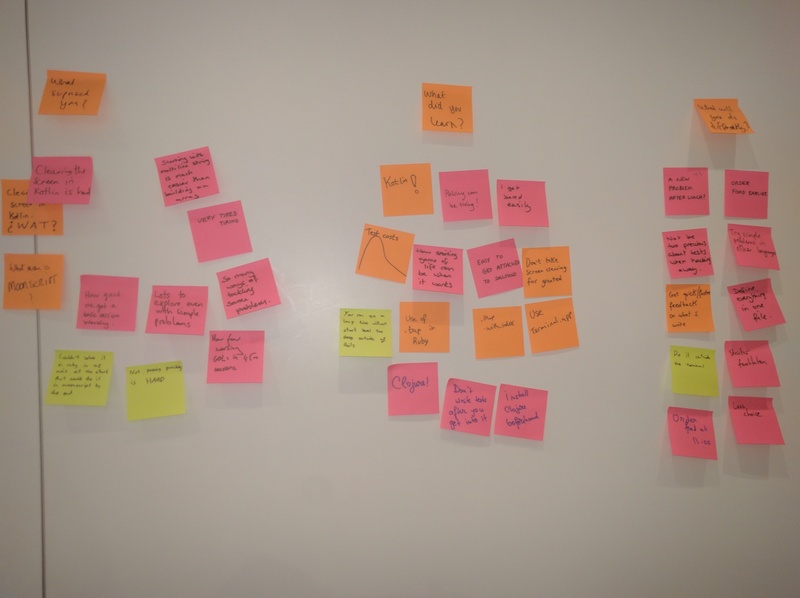 At the same time, the encouragement to discard your solution after each iteration helps you focus on applying a different technique every time, rather than improving an existing solution. The initial state of the grid is the seed of the system. Applying the rules above to every cell simultaneously will yield the next generation. We started out with little idea of how the day would go. 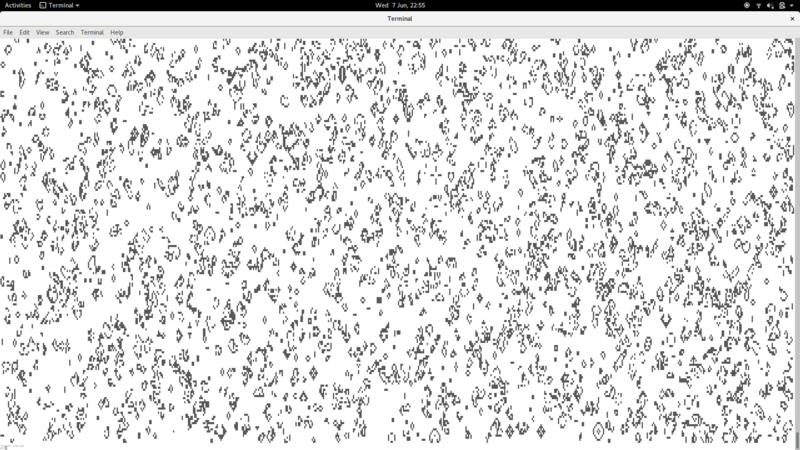 Our first couple of attempts at writing the game on screen was a sort of warm up for what would come next: putting various restrictions on ourselves in order to challenge the way we could complete Conway’s game of life once we got our first solution down. We then voted on which approaches we’d like to try for the rest of the day. We chose the following: primitives can’t cross method boundaries, methods no longer than three lines, write it in a different language. On our first iteration we tried to get our heads around the concept of sending messages between methods without using primitives. We focused on the mutability of the data and how we could get away with computing the next generation’s mutation. This was a nice respite from the previous challenge. It was cool to see just how much brevity could be used to push our code to it’s shortest length. To end the day we had a retrospective in order to better understand what worked and what didn’t with a view to making the next code retreat even better. We had three questions to get us thinking, “What surprised you?”, “What did you learn?” and “What would you do differently?”. The feedback showed the event was a success, we all enjoyed it and had opportunity to learn something new and get to work with fellow Unboxeders, win win! Most importantly we recognised our mistakes which will help us improve the next time round. The voting on the conditions didn’t work so well, some of them were similar and we felt it would have been better if they were chosen ahead of time with thought given to the different ways of thinking they would encourage. We also allowed ourselves to go a little over time for each challenge if we were enjoying ourselves or close to completing the solution, in hindsight if we were stricter it would have allowed us to attempt more of the conditions. Finally we did a bad job at ordering food so were all pretty hungry when it turned up mid-afternoon!